Peter Johnston with pupils at the Emmanuel Ministries school in Kolkata. 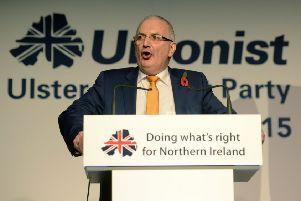 Northern Ireland’s newest local councillor, Peter Johnston, missed his first scheduled meeting as an elected representative – but he had a very good excuse. The young DUP man, who won a seat on Mid and East Antrim Borough Council in a by-election in his home town of Carrickfergus last month, was in India carrying out humanitarian work. Peter and his fellow volunteers hand out goodie bags donated by Mid and East Antrim Borough Council. The 28-year-old married father-of-one was part of an eight-person team who travelled to Kolkata (formerly known as Calcutta) to help out at a boys’ home and a school in an impoverished area of India’s third largest city. Explaining how he got involved in the project, he said: “Around 10 years ago, my mum and dad went out to Kolkata to visit a friend they know who supports a programme that works with homeless children. They both loved it and felt compelled to get involved themselves and help. Every other year they take a team out to help practically and financially and this year I decided to go. “The charity (Emmanuel Ministries Calcutta) runs many different projects, including drug and alcohol rehabilitation centres, two children’s homes, food programmes for homeless street kids and an English-medium school for 500 impoverished children. “The founder of the school wanted to provide a top quality education for the poorest of children in Kolkata and it is now one of the highest-rated private schools in the area. The criteria for joining the school is strict and designed to ensure the children who get in could not have afforded a private education otherwise. Peter Johnston presented young people at a boys' home with rugby kits donated by Carrickfergus Grammar School. “Around 40 of the children are from the children’s homes and would have been rescued during their early years. All are fed throughout the day and do not leave without a full stomach. “It is truly inspirational to see a school that could easily charge thousands of pounds in tuition fees for the standard of education, delivered to the poorest children in their community for free. “Our main project was to paint the boys’ home. The home houses 15 boys aged 9 - 21 years old. Most of the boys in the home have come from situations that you can’t even imagine and it is so humbling to see them valued and loved by the charity workers who have given them an opportunity. Many people kindly contributed to this trip and with their money we were able to buy them a TV and a printer for their computer. Determined that his work for the charity won’t be limited to his time in India, Peter is now doing his bit to try to secure UK government funding for a much-needed project for vulnerable children. “We are currently in the process of applying for international aid funding through Westminster’s Small Charities Challenge Fund so it was a good opportunity for me to meet with the executive director to begin this process,” he said. “For three years now the charity has been waiting on funding for a project that aims to build a sustainable drop-in centre for the railway children, to provide a shelter, food and classes for those who need them. The centre is also planning to grow vegetables and sell bottled water to contribute to the running costs. While disappointed to miss his first council meeting, the former Carrickfergus Grammar School pupil stressed that he had committed to taking part in the trip to Kolkata long before he knew he’d be standing in last month’s by-election. Peter, who is married to Tory, the daughter of South Antrim DUP MP Paul Girvan, says his Christian faith and his active role in the church is “a very important part” of his life. As someone who has had an interest in politics from a young age, Peter is keen to put his “enthusiasm into action” and help make a positive difference in his home town. “My wife and I had our first son in June and I genuinely want Carrick to be a positive environment for him to grow up in. “Local councils now have a greater influence on local issues and I am looking forward to contributing and delivering value for the whole community. “My ambition is to see Carrickfergus as a thriving town for tourism and a local economy that boasts quality jobs. “I realise it is a short period until the next election (May 2019), but this has further motivated me to get working on delivering on the key issues pledged during my campaign,” he added.